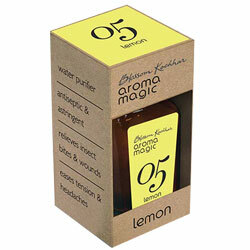 Buy Aromamagic Lemon Oil Athlete's foot, chiliblains, colds, corns, dull skin, flu, oily skin, spots, varicose veins, warts. Relieves insect Bites and Wounds. Aroma is similar to fresh lemon rinds except richer and more concentratedt. A refreshing light oil. Classic remedy for sore throats - gargle add 2% to warm water. Excellent antiseptic - dab neat on insect bites and stings. To stop bleeding dab on small cuts in a 2% solution in boiled water. Use neat on warm and verrucas.